Learning how to add a song to a playlist on iPod can get you pumped up for your workout sessions, design musical routine for your commute to work, and set the mood for romantic evenings. Picking and choosing your favorite tunes or designing your own categories gives you the power to be your own DJ and separate the best music you want to hear away from the general music population on your device. Understanding what type of music makes the best playlist comes from trial and error, but if you want give it a shot and learn how to add a song to a playlist on iPod and enhance your music experience, follow these simple steps. Step 1. If you have an iPod Touch, open up your music application and it will bring you to a playlist screen which current playlists that may be already created on your iPod. If you are working with an iPod classic, scroll to music and select it using the round center button. Step 2. With iPod touch, select the option that says ‘Add a Playlist’ and a prompt will come up asking you to name the new playlist. 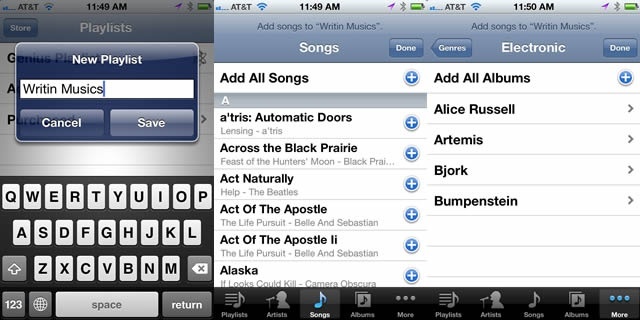 Type in a name, select okay, and it will bring you to a list of all the songs you have available on your iPod. On iPod classic, scroll down directly to a song you want to add. Step 3. iPod touch will let you browse through each individual song in your library and click the blue plus (+) icon next to the song if you’d like to add it to the new playlist. Only click the icon once or it will add duplicates to your playlist. iPod classic requires you to scroll to each song and hold down the center button to add the song to the “On-the Go” playlist. Step 4. When you are done selecting music to add, click the ‘Done’ button at the top right corner of your iPod. Now when you navigate back to your music app, the playlist screen will show your new playlist which you can open and shuffle through. That’s all there is when learning how to add a song to a playlist on iPod. Once you get the hang of it, you can begin to experiment with different types of music and figure out what works best for you based on your preference.